By @ShaunyNews > This is a blog I am almost opposed to, it’s about war and what it does to the people who enter it’s cold shadow, I dislike war, I dislike illegal War but I am looking past all what I believe loved ones and their own. The image to the left is the utter reality of War, make no mistake. When we look at these men and woman who are putting their lives on the line wherever they are from in the World, fighting this ‘War on Terror’ a terror only getting worse as we have seen in Australia, France and lately and the ones before where the terror came home to us all, we often forget the psychological cost it has on the individual. We see them on the news and we seen images of them coming home We have to ask, the person that left the first time from family and loved ones on their first tour, is that person the same person who returned home after their last tour? I just watched an amazing movie “American Sniper’ and seen firsthand what War can do and does do to people when they finish their tours for good and come back to civilian life and struggle, they want to be back in that war zone or the war zone has killed their minds. I just sat and watched this movie about an American Soldier. He was famous, called the ‘Legend’ true story. He did his tours he came home, he battled the demons and became husband and Daddy all over again. Amazing story, I can’t ruin the ending, but if this movie doesn’t win an Oscar for telling up close and personal the tragic part of war, not the killing and fighting, but for those left at home. The parents, the partners, wives and children. I cried at the end, but I know crying is ok, it is what makes us humans, human, so I guess I am human. Understanding pain is something we all must one day confront, I guess I confronted it a long time ago and know how blessed I am to be here and have loved ones who love me. If I could fight I probably would you know, sadly I am disabled now, 41 years old and fighting a different fight, the same fight we all fight, that is life, so take it for granted, whatever your story. Many have it worse so if you can read this, you are lucky, I just hope and pray one day wars can end and peace can happen. Sadly we are closer to a big war than we have been since the start of the Cold War, so more men and woman will go and fight because they feel they have to go and do that, we must respect that person right? This movie is must see, but for those of you who have been through its reality, my heart goes out to you, especially the ones who lost. ‘Possible’ Sign’s of Vote Fraud in USA! This is a court case PROVING that vote fraud is VERY, VERY easy in the electronic way. Many I am speaking to want a “Paper Vote” Can we be sure it doesn’t work either, Scotland knows this! So it’s not only possible, but PROBABLE. The Virginia Department of Elections confirmed that some voters reported having a different selection appear after making their choice on the electronic ballot. The department released a statement later Tuesday afternoon in response to the issue. “Virginia Beach and Newport News are experiencing technical difficulties with their AccuVote TSX Touch Screen voting machines,” the Dept. of Elections said. “These technical difficulties are being addressed by both localities’ teams of voting equipment technicians in conjunction with AccuVote vendors. Based on discussions with local election officials, the issues appear related to touch screen calibration.” The elections department says voters should double check their selections before submitting their ballots. It also says any machines that show issues are immediately taken out of service and there are still plenty of other machines for voters at the affected locations. Historical Vote Fraud Claims: Also people who were giving testimony of ‘Vote Fruad’ dying days before the court case, NUMEROUS PEOPLE! HOUSTON, TX. — November 4, 2014: True the Vote (TTV), the nation’s leading voters’ rights and election integrity organization, today issued the following incident report from Bexar County, Texas. 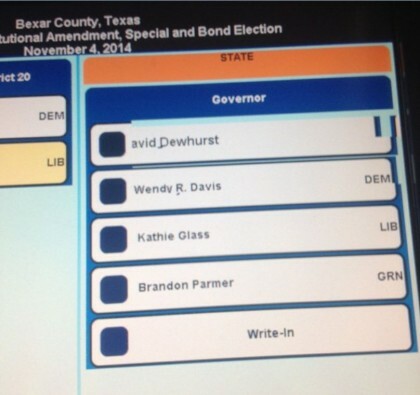 According to Washington Free Beacon reporter Lachlan Markay, a voting machine in Texas has Lieutenant Governor David Dewhurst listed as the candidate running for governor. Dewhurst isn’t running. Is There an Older City Under the Ancient City of Cusco Peru? Whole Street Closed to search and preserve! Closer look at the stairway, WOW! I did an article a few months back asking if the USA is close to Nazi Germany 1932/1935 when this is happening in the USA was slowly happening in Germany. I have asked if the USA is a Police State, I have asked why the constitution is being ripped up and re-written while the American people watch TV and think their life is good. Sadly America, your country is Fascist to say the least, this is VERY SAD. I think the questions I have been asking are being answered, surprisingly by certain US Media outlets. I know dozens of Americans who want to leave the USA but can’t afford to, they are FORCED to have Health Care Insurance and if they don’t take it they pay a fine every month, many pay the fine as it’s cheaper, 600 people a day die in the USA due to having no Healthcare. And this is the “World’s Leader”? This is the World’s beacon for freedom, a country that war’s all over our planet in the name of ‘Democracy’ and a democracy they can’t and don’t afford to their own populous at home in the USA. Anyone within the USA who can’t see the slow but steady change in the USA to a Police State to Fascism. Many asked me “Do you really think the USA is like Nazi Germany” Well if you research like I do the parallels are the same. A “no refusal” checkpoint where drivers will be forced to stop and potentially submit to having their blood taken on the side of the road by law enforcement authorities is planned for Clark County, Ohio tomorrow. “Every car will be checked to ensure that drivers are not impaired. If there is sufficient probable cause to believe that a driver is operating a vehicle while impaired, law enforcement will seek a blood search warrant from a “neutral and detached magistrate,” reports ABC 22. The time and location of the checkpoint will not be released until hours before it is set to begin. Once a search warrant is obtained, a nurse will draw blood to check for alcohol or drugs. It is not specified whether the blood draws will take place on the side of the road or at a nearby jail. Although the practice of taking blood from motorists suspected of being under the influence has been the law in numerous states for years, many remain unaware of how those who refuse to consent to the procedure are treated. Last year we highlighted shocking video footage out of Georgia which showed police officers forcibly strapping down citizens accused of drunk driving before putting them in a headlock and having a nurse draw blood. As the clip shows, even compliant individuals who are showing zero resistance have their heads forcibly pushed down as the blood is taken. “We all are American citizens and you guys have me strapped to a table like I’m in Guantanamo f***ing Bay,” complains one individual. Another man screams “what country is this?” as officers hold him down and take his blood without consent. “Holding down and forcing somebody to submit to this is really intrusive in terms of that level of invasive procedure into someone’s body is ridiculous for investigating a misdemeanor,” Attorney David Boyle told Fox 5 Atlanta, describing the forced blood draws as an “unreasonable search” under the 4th Amendment. In 2005, the Supreme Court ruled that it is not unconstitutional for the state to hold down Americans and forcefully withdraw blood. A January 2013 ruling affirmed that a warrant must be obtained for the process, although police could dispense with the warrant requirement in an “emergency”. As we reported last December, citizens are also being intimidated into participating in so-called “voluntary” drug survey checkpoints, during which private firms working on behalf of the White House Office of National Drug Control Policy take DNA samples from motorists by swabbing their cheek. Evidence clearly indicates that sobriety checkpoints have little to do with saving lives or catching drunk drivers and everything to do with revenue generation. In states like California, the number of vehicles impounded as a result of license violations is seven times higher than the number of drunk driving arrests during checkpoint operations. In the middle of a war, civil war, this couple stopped and sent a powerful message.